Upton Juniors girls’ football team will represent Thanet in the Kent schools finals after retaining the local DW Trophy. It is the eighth time in ten years that Upton has triumphed in this competition and now the players have set their sights on the county finals at Thamesmead, aiming to retain the Kent championship they won last year. Two Upton teams joined another 14 local schools in the competition and both Upton A and Upton B won their groups. While Upton B bowed out on penalties in the semi-finals, Upton A beat Newington in the final via an Alesha Beach goal to retain the trophy, again without conceding a goal themselves for another successive year. Upton’s all round performance was impressive – the defence shut up shop and did not concede a goal, the attack scored 11. Deputy Head of School Dave walker said: “Upton is proud to fly the flag for Thanet at the county finals and we will do our very best to represent all the teams that competed in the qualifying tournament. 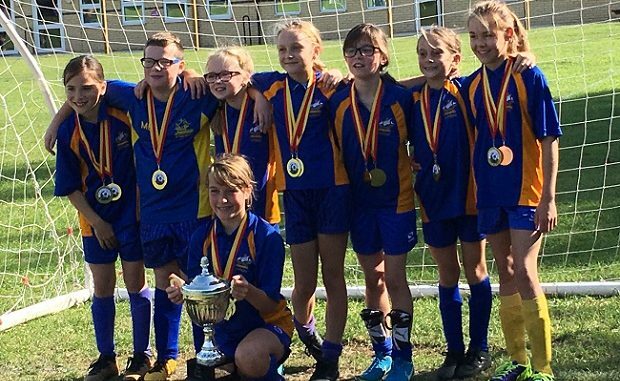 The girls’ success follows the triumphs of Upton boys won recently won their first trophy of the year at the inter-schools tournament hosted by St Lawrence College in Ramsgate.